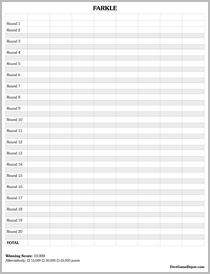 Click the image below to download our free printable Farkle score sheet to track scores for up to 8 players. Also see below for our convenient (and also free!) Farkle scoring chart and rules summary. 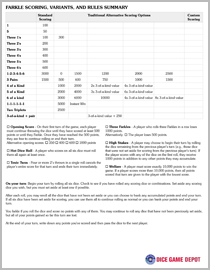 Our free printable Farkle scoring and rules summary lists standard, variant, and custom scoring options, and also provides a handy rules overview! See below for an explanation of how this chart works. The column labeled Standard Scoring shows the most common scoring options. The numbers in the Traditional Alternative Scoring Options columns are optional scoring values you can use to create endless variety in your Farkle games. Just choose or circle the values you want to use for a particular game, crossing out any standard scoring option that you are substituting for. Use the Custom Scoring column to create your own scoring options! In the example below, three sixes will be worth 1000 points instead of 600. The standard scoring for a straight (1-2-3-4-5-6) is crossed out and a score of 1500 will be used instead. Any 6-of-a-kind rolled will score four times the regular 3-of-a-kind value, so for example, six 3s would score 1200 points (4x300=1200). Finally, the Two Triplets variant has been selected, and the Three Farkles variant has been selected as well. During the game, players can easily reference the sheet to remember what scoring options they've chosen.